Wow! It worked! Finally I manged to post a picture here, partly thanks to Vrinda who gave me some instructions. Thank you, Vrinda! This is the top part of the cover of Bild journalen 2 december 1964. Inside, there's an interview with the group (in Swedish) and black and white photos of each one of the members, sitting in a park. "Hollies håller igång" means something like " The Hollies keep going". Wow, Agneta! Those photos are beautiful! I love the way Allan hold a leaf over his eye and, of course, the way he has his hand on Graham's shoulder. They seem like the closest of buddies. Bobby looks so adorable, and so do Tony and Eric. Thanks for sharing this with us, and you're welcome about the uploading advice! Thank you Agneta,super photo.I love the different things the lads are doing with the leaves.But I can think of a few sexier photos which involve leaves .Is anyone with me here? I sure am! I don't know if the boys will be, though! There's something about autumn, falling leaves, and the Hollies that gives me these very sensual feelings! Is this the same magazine that Graham Nash gives a shout-out to in their Christmas single? Yes it is. 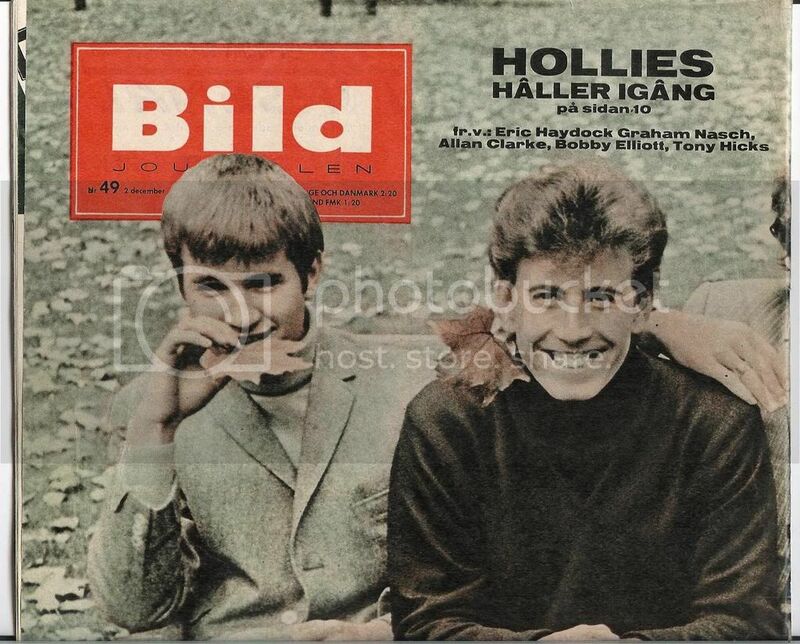 I subscribed to Bild journalen for some years in the late 60s, and the single with the Christmas greetings from the Hollies was included with one of the issues. I've still got that single. Here is my translation of the article from 1964. It’s us THE GIRLS SIGH FOR, by Andy Gray. Even though they seldom reach the top of the lists, millions of pop fans love them. Why – that’s what we will try to explain in this article from London. What is The Hollies’ secret? The Beatles and The Stones have their significant trademarks, but what have The Hollies got? Well - their kindness, their charm. Look at the pictures of the “hollie-guys” on this page and agree with what many many pop fans think: Graham, Tony, Allan, Bobby and Eric are lads who lack the radiance of stars. They are a quintet you’d happily invite home for coffee, or share a bottle of lemonade with. Just because they look so friendly, harmless and “ordinary”! The Hollies are looking forward to Christmas, even though they won’t get much time to spend in their homes. -	but we’ll almost be spending Christmas day at home in Manchester, says Graham Nash, the “chairman” of the lively group. -	And indirectly, we’ve got the Beatles to thank for that! -	Well, last Christmas, John, George, Paul and Ringo introduced something new in their Christmas show. They didn’t just play pop music, they also did a couple of sketches. -	Because of that, many more pop groups get the chance this year. We’re playing in a show like that in Liverpool. -	It really will be fun to fool around on stage, says Graham – Privately, we’re always larking about, so why not on stage as well? -	If we are going to do an act where we just talk, I want to do the John Lennon style, says Tony Hicks. -	Hey guys, what about me as the hero? Everybody was laughing at Eric Haydock, the bass player, but he himself didn’t think it was a bit funny. That’s how they keep on, the “hollie-guys” – It’s the only way, says Graham. -	When you are touring ten months a year, day after day, you must try to have fun. Otherwise we would kill each other. -	In the bus, when we travel from one town to another, we sing and try to come up with new melodies. A couple of the Hollies’ hits have been written in their big American station wagon. -	We always travel together. Then we never have to worry about any one of us being late for a recording session. The Hollies is a big name in today’s world of pop. -	But when we arrived in London in February 1963, we barely had £70 between us. We were – to put it mildly – frightened and insecure. Today we have equipment for £2 000 in our own bus, a car worth more than that. We have quite a lot of money. Allan’s got an apartment in London, but the rest of us are staying in hotels. We feel at home in Manchester. The Hollies are almost the only top pop band that still hasn’t visited the USA. Gerry and the Pacemakers, Billy J Kramer and the Dakotas have been there, the Stones, the Searchers, Dave Clark. But the Hollies have stayed at home. -	Are you afraid to take the chance abroad? -	Not at all, they all answered, almost simultaneously. -	We would like to travel, but it just hasn’t happened yet. We were going to America, but our plans were changed. Too bad, but we’re not exactly crying. The reason is probably that the Hollies still haven’t managed to climb very high in the American hit lists. -	But we’re not worried. We’ve got plenty to do while waiting for The Hollies to become a name in the States. And the Hollies really do work; that’s no exaggeration. During the last two months they have been on two big tours. The first one they shared with Freddie and the Dreamers, and the other was their own show, with Dixie Cups and Heinz as guests. Right now they are rehearsing their Christmas Show and recording a new LP and a new single. The five Manchester lads like to fool around, but when it comes to recording, they are qualified musicians. The boys still smile when they think about their latest hit, “We’re Through” It was a product of all the pessimistic rumours surrounding them, saying that “because they can’t go to the USA, the Hollies have got to be through”. The Hollies knew there was no truth in the rumour, of course, but thought it could be fun to challenge it by recording a song named “We’re Through”. The critics had the opportunity to say “yes, The Hollies really are through”. But not a single one did that. So therefore the Hollies keep on – to their own and their fans’ great joy. The five guys get on well together, even though they come from different camps.	.
BOBBY ELLIOTT, the drummer for example. He is and will always be a jazz drummer. -	But, he says, you can’t make a living from playing jazz in England. So pop music will have to do. TONY HICKS, the solo guitarist, is another jazz lover. His favourite is Barney Kessel. And no one is surprised it was Bobby and Tony who wrote “Keep Off That Friend Of Mine” from the record “Just One Look”. They have one more thing in common – Bobby is going out with Tony’s sister! ALLAN CLARKE, is the Country and Western man of the group. He was very happy when “So Sad” became one of the songs The Hollies perform on stage. In that song, he and Graham make you think of the Everly Brothers. GRAHAM NASH, is really more of a Rhythm and Blues friend. Chuck Berry is his companion in the musical field. Graham’s best friend is Brian Jones of the Rolling Stones, who also is a dedicated Rhythm and Blues friend. So there you have The Hollies. The guys who never take an unnecessary break in their hard work. And who are happy to travel and work even harder. Will they come to Sweden? Agneta ,superb work.Thank you so much .1964 "We,re Through", that's funny.Did anyone think that 44 years later they'd still not be through?Ah! nice boys that you could drink lemonade with.Isn't that sweet.They always had that safe image that appealed to many,so different from alot of the other bands.Though having said that I could think of a lot of things that I would like to do with the boys and drinking lemonade wouldn't be one .But that's me ,always lowering the tone That Christmas show sounds great. 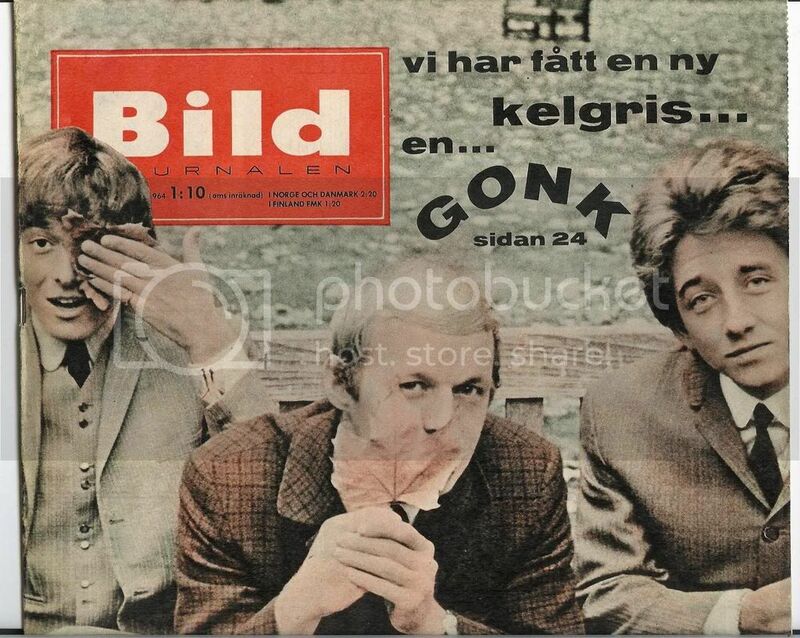 To have been there must have been so much fun.Charming lads indeed.Thanks again, Agneta. Yes, thank you so much, Agneta! What appealed to me about the Hollies was their friendliness and charm. These are definitely guys I wouldn't mind inviting over . I like their attitude about wanting to press on and not be too worried about becoming famous and just focus on their music. Too bad they didn't get to come to the U.S. in 1964. They would have been a smash. I wonder what made them put those plans on hold? To have seen that Christmas show and the boys larking about - what a thrill! The Dixie Cups were an American girl group, a little like the Crystals and the Ronnettes. They got to tour with the Hollies! I'm so jealous! Allan had an apartment in London! I wonder how he decorated it. Allan had an apartment in London! I wonder how he decorated it. [/quote]With pictures of me, . With a few of me thrown for good measure! With decor like that it's a wonder he was able to tear himself away from his flat .Thank god he did though . Yes, that was a blessing! Once again, thank you Agneta for that wonderfeul article and translation! [quote="Agneta"] Just because they look so friendly, harmless and “ordinary”! Friendly and harmless, yes; but never "ordinary"
Just because they look so friendly, harmless and “ordinary”!